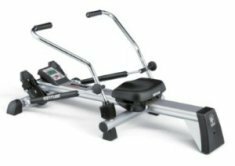 Most rowing machine dangers are the result of someone who is a novice at indoor rowing not using the machine properly or not preparing sufficiently before exercising. If you take the appropriate precautions and go slowly when you start using an indoor rower, you can get an efficient cardiovascular workout while toning your muscles and burning calories. Many rowing machine injuries are pulled or sprained muscles, most often to the lower back or in the arms. This is because many people use their arms to carry the brunt of the load when rowing, which is a result of incorrect form. In fact, you should use your legs, and particularly your thigh muscles, to carry the majority of the force of rowing. Lower back injuries are common because many people curve their backs either too far forward or too far back when rowing. As with any form of exercise, you have to warm up before jumping into a workout routine. Do at least five minutes of warm-up and stretching exercises before you get on a rower, otherwise you risk straining stiff, cold muscles, which could put you out of commission for days or even weeks. Make sure you warm up both upper and lower body muscles and your core before you begin rowing. Some of the most painful injuries are to the wrist, including carpal tunnel injuries. These are often the result of twisting your wrists into awkward positions while rowing. To protect your wrists, always keep them palms down and straight throughout each stroke. Resist the impulse to bend your arms at the wrist, which is one of the most common rowing machine dangers. Imagine that you have a rod in your back keeping your spine straight. While you may lean back slightly during some phases of your stroke, this should be minimal and the spine should not curve or arch; be sure you’re carrying your weight on your buttocks, not on your lower back. It’s especially important not to curve your back and hunch forward to grab the handlebar or when your body rides forward on the rails. Straighten your arms to a full extension rather than curving forward to prevent middle and upper back injuries. Leaning too far back can aggravate the lower back, so be aware of your posture at all times to avoid rowing machine dangers. Novice rowers often let the bulk of their weight rest on their arms and pull hard on the handlebar to move through their stroke. This can lead to serious arm injuries. You should push off with your legs rather than pulling with your arms at the beginning of each stroke so that most of the resistance is on your legs, particularly your thighs. The best way to make sure you’re using the proper form when using a rowing machine is to have an experienced rower watch you as you go through several strokes. He or she can then point out what you’re doing right and what you need to correct in order to prevent rowing machine dangers that can lead to serious injuries.